Today there is a growing movement toward teamwork in nursing. The number one goal of teamwork in nursing is the same as the goal of teamwork in health care in general, and that is the best outcome possible for every patient. Since the establishment of team models, quality of care has increased and there have been many benefits for the health professionals as well. Large and small hospitals and other health care facilities across the United States and Canada have moved to or are moving toward a team approach. So far, in practice, the teamwork in nursing approach has had many benefits. Attitudes among many of the nurses have changed from each one being self-concerned to more of an attitude of wanting to help out one another whenever possible. 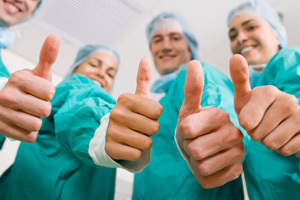 One Illinois hospital reports that nurses are much more apt to help each other since the team approach was introduced. Before, nurses were likely to have a “it’s not my patient" attitude. Now nurses will offer to assist with each other’s patients should a nurse be involved in a trauma or simply have patients piling up because their patients’ needs were more demanding or time-consuming. A nurse who has only one or two patients will often help out another nurse who might have five or six patients. Teamwork in nursing involves all of the nurses sitting down together to discuss any problems that have come up over the course of the day or week. All nurses are involved in decision-making processes even if a particular nurse is not happy with the teamwork approach. There will always be a few nurses who aren’t going to be happy with any situation, just as there are in any group of humans. The retention rate of nurses is much higher among institutions where there is a teamwork in nursing approach. One of the reasons is thought to be the fact that inexperienced and experienced nurses work together closely. This leads to an atmosphere of mentoring. Where once a young nurse might not have asked for assistance or might have gotten overly frustrated, now there are always several nurses happy to help out. Where at one time newer nurses were hesitant to ask questions or approach the more experienced nurses, with a team concept nurses communicate better with one another and grow to respect one another. There is much more a feeling of camaraderie and nurses are more likely to form friendships with one another. No matter whether it is in a hospital emergency room, in hospital wards, long-term care facilities or community care, the concept of teamwork in nursing puts the patient at the head of the team. The whole team is only there because of the patient and they work together for the benefit of the patient. The only goal for all involved is a successful patient outcome. Teamwork in nursing has these characteristics: good communication, respect for one another, shared planning, common goals, cooperation, coordination, sharing of expertise, and shared decision-making. With teamwork in nursing, statistics show that nurses are happier with their jobs and patients are happier with their nurses.